Andy Avalos has the full forecast update for the Chicago area. 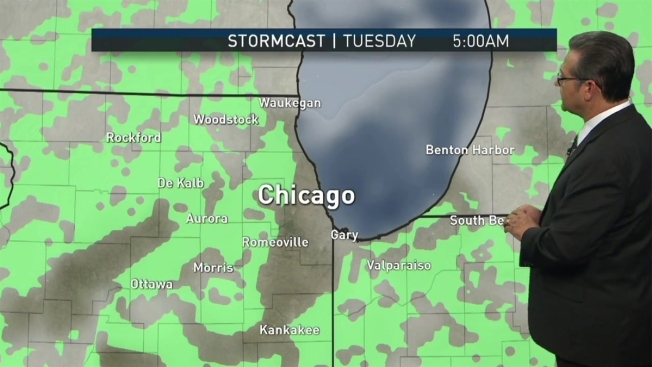 Rain and storms remain possible for parts of the Chicago area after a short-lived severe thunderstorm warning expired Monday afternoon for Will and Cook counties. The warning took effect just before 2:30 p.m. for north central Will County and south central Cook County until 3 p.m. The National Weather Service warned of potential quarter-size hail. Radars showed scattered showers and storms developing in about 30 percent of the area with an isolated cold air funnel or land spout possible. Spotty showers were possible Monday night as well. Daytime highs were expected to reach the low-to-mid 70s, dipping overnight to 57 degrees in the Fox Valley and 65 degrees in Chicago. More scattered showers are expected Tuesday morning amid mostly cloudy, hazy, mild and muggy conditions. A few scattered showers and isolated storms also are likely in the afternoon. The day looks seasoanbly mild with highs in the mid- to upper 70s, but cooler near the lake. Mostly cloudy skies on Wednesday morning give way to more sunshine in the afternoon and seasonably warm high temperatures near 80 degrees. The next chance for rain comes Thursday with a few scattered showers and storms possible. The warmest days of the week look to come this weekend with highs in the low 80s on Saturday and mid-80s on Sunday. Scattered showers and storms are possible again late Sunday afternoon and evening.